When in Penang, nightlife is all about alcohol, bonding, chilling and basically just have fun. You’ll notice in the heart of Georgetown, the night is very happening. Bars are mushrooming at a fast pace just like cafes, and most of the styles are quite typical. We happened to stumble across Scissor Sisters Pink Lounge amongst all the bars, and boy it caught our attention. 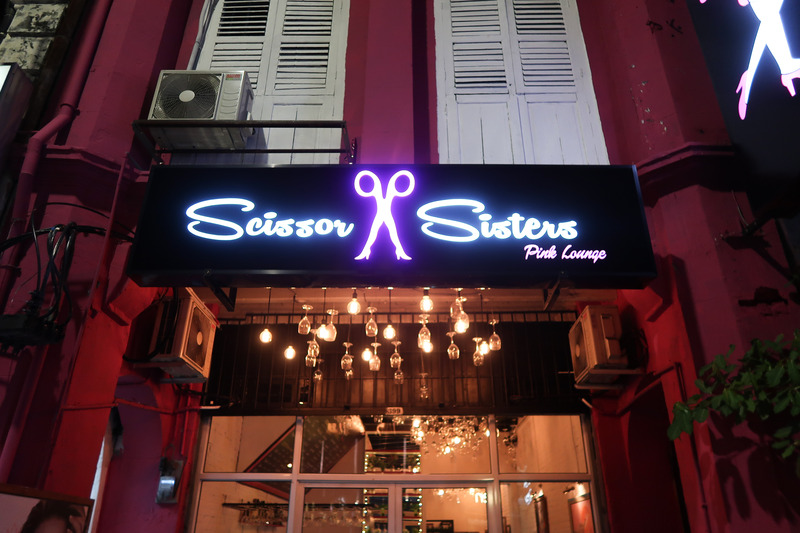 Scissor Sisters Pink Lounge is the first Ladies Bar in Penang, probably also the first in Malaysia. 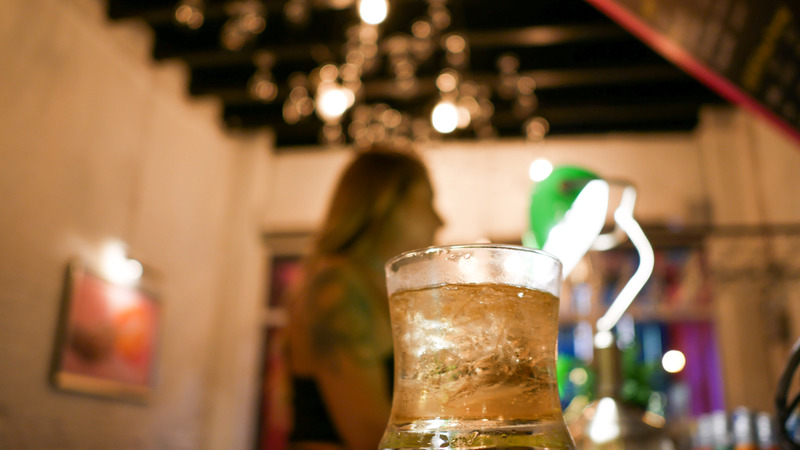 It’s no secret that all kinds of things happen in a bar, and ladies are often the victim. That’s the purpose of Scissor Sisters Pink Lounge, to provide a safer and better ambiance for ladies to chill and have fun. The entire place speaks modern classy, with a touch of pink to resemble the purpose of the space — ladies bar. Designed with wine glasses, bold photos with an European hint. Stand alone it sounds messy but when combined together, it’s another style. And oh my, look who’s standing behind the bar! Luckily men are not allowed to enter, they might turn into wolves (Ps: it’s a joke la). Even we ladies fell for her charm, don’t you think so? Moving on to drinks, we must say we ladies were impressed. Keep in mind that Scissor Sisters Pink Lounge is a Ladies Bar, so drinks served are towards sweeter side and vibrant. Of course, if you’re bold, just ask the bartender for customization. Lady in Pink, sounds girlish right? You can sort of guess the flavor. Smooth, sweet with a strong hint of coconut, the combination blends perfectly together. You’ll think as if you’re drinking some flavored milk instead. Not to miss out the blue when they have pink. Blue Balls has a sweet tint as well, but bolder in terms of the taste. If you love the taste of medicine (sounds weird? ), well this is for you. Perfect way to get rid of your Monday Blues. Brain Hemorrhage, intimidating yet exciting at the same time. Indeed, the shots do resemble alien brains, ombré blue and pink with white fruit pulps. Take it down and the flavor would surprise you. You’d think that you’re drinking both Lady in Pink and Blue Balls in one single shot. For the independent, strong women who loves a cuppa, try Espresso Martini. At first sip, you taste nothing but smooth Espresso. Take a few more sips and the Martini will linger in your taste bud, not overpowering but enough to feel it. Those who fancy liquor coffee can try this, we bet you’ll love it. You guys might be waiting for the critiques, but no we have no complaint with Scissor Sisters. What’s better than a spot for ladies to have a glass or two together, great ambiance and of course, gorgeous bartender. Pss: A few words from owner: “My toilet is the cleanest in Georgetown.” Is it true? Well you have to find out yourself. Operating Hour: 9 a.m.-1 a.m.
Scissor Sisters… Lol. Lesbian bar.